Alfalfa favourably Influences nutrition evidenced by the toning, up of appetite and digestion. It improves mental ard physical vigour. with gain in weight. A healthy restorative to the pregnant and old people it improves muscular power poor digestion & obstinate constipation. 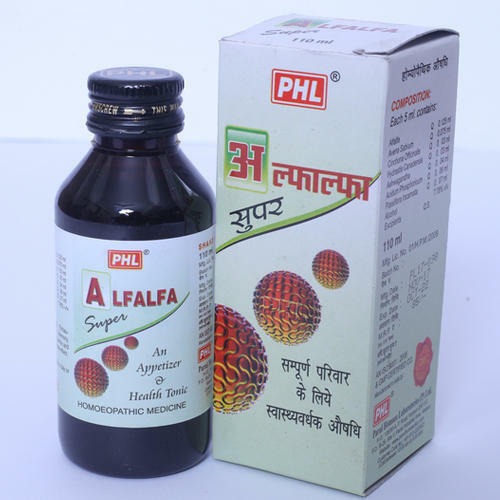 Since our commencement in the year 1988, we, Parul Homoeo Lab Private Limited, are acknowledged in the industry as one of the prominent organizations, engaged in manufacturing and Exporters a commendable range of Homeopathic Dilutions, Homeopathic Mother Tinctures, Homeopathic Biochemic Tablets, Homeopathic Globules Sugar Pills and much more. The range offered by us encompasses. The range offered by us is processed with the aid of modern machines to leave no scope for impurities. Owing to our packaging facility, we have been able to dispatch the offered range in committed time-period.